Southcote Junction, just southwest of Reading is where the mainlines from Reading or Didcot diverge for either Basingstoke in the south or Newbury and beyond to the southwest. Before the railway arrived the land was a continuous flow of gentle rolling landscapes from the Coley Park estate to the Southcote estate. The land being on higher ground looked over to the meadows below with the Holy Brook rivulet and the Kennet River in the distance. When Isambard Kingdom Brunel arrived in 1846 with his team of navvies, he cut through the hill and divided the estates, using the material from the cutting, which extended back as far as Oxford Road in West Reading, as part-fill for the embankments needed to cross the low-level meadows. The landowner at the time was John Bligh Monck of nearby Coley Park estate, who held the title of High Sheriff of Reading. Unidentified 'Hall' at Southcote Junction. In 1845 an Act of Parliament was passed to allow the construction of the Great Western Railway endorsed Berks and Hants Railway from Reading to both Basingstoke and Hungerford. The rail line from Reading to Westbury was commissioned with Isambard Kingdom Brunel as engineer. The first 25½ mile (41 km) broad-gauge section from Reading to Hungerford was opened on 21 December 1847. 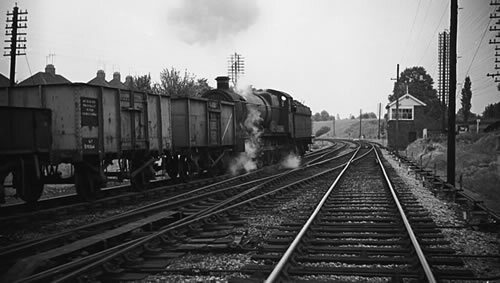 On 1 November 1848 the line was split at Southcote and a 13½ mile (22 km) broad gauge line south to Basingstoke was opened and Southcote Junction was formed. By 1892 standard-gauge track had been laid throughout the Great Western Railway, with the last broad gauge services ending on 21 May 1892. A new signal box was built at Southcote Junction in 1896 and in 1908 the Coley branch line opened to traffic. 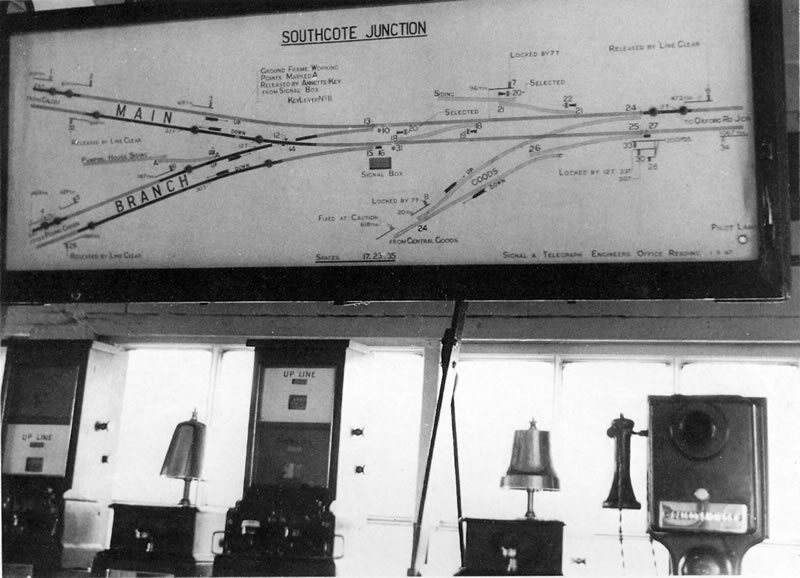 Southcote Junction Signal Box, 2½ miles south-west from Reading station, was opened in 1896 replacing an earlier box. 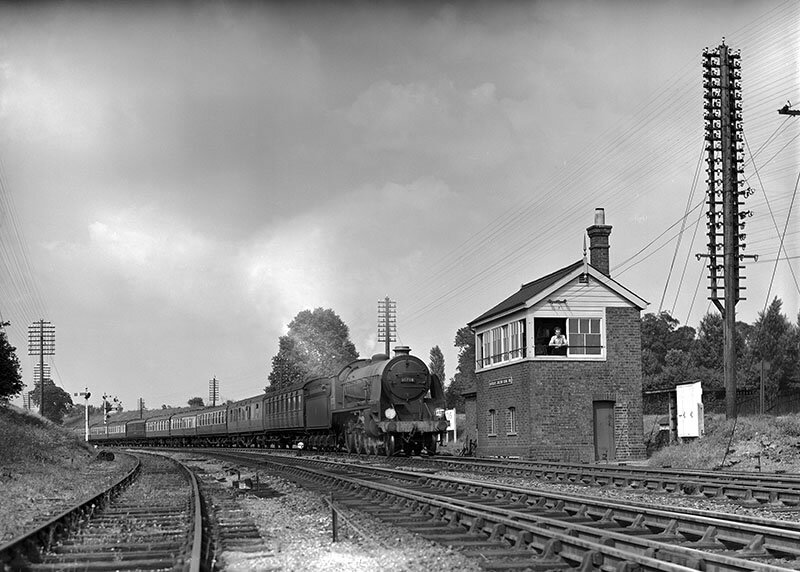 In 1908 it was upgraded to provide signalling and interlocking apparatus for the new Coley Branch Line. It provided service for 69 years and was closed on 26 April 1965 (and dismantled soon after) when the track signalling was updated from semaphore to electric aspect lights controlled by Reading Signal box. 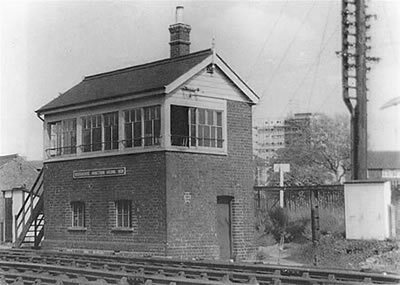 The signal box was a fairly standard GWR design built in a red-brown brick with the interlocking signal equipment located on the ground floor and the signal cabin with its row of 35 levers located on the first floor reached by a set of exterior wooden steps at the left hand side. Wooden window frames were painted white, as were the gables. The cabin had a small standard fireplace and chimney. A water tap was located at the right rear of the building. Entry was gained via a padlocked iron-railing gate from the accessway between Coley Park estate and Southcote estate. 30738 King Pellinore heads the down York to Bournemouth past Southcote Junction signal box in the early 1950s.